I was on a panel at Raindance last night! Which was pretty exciting. 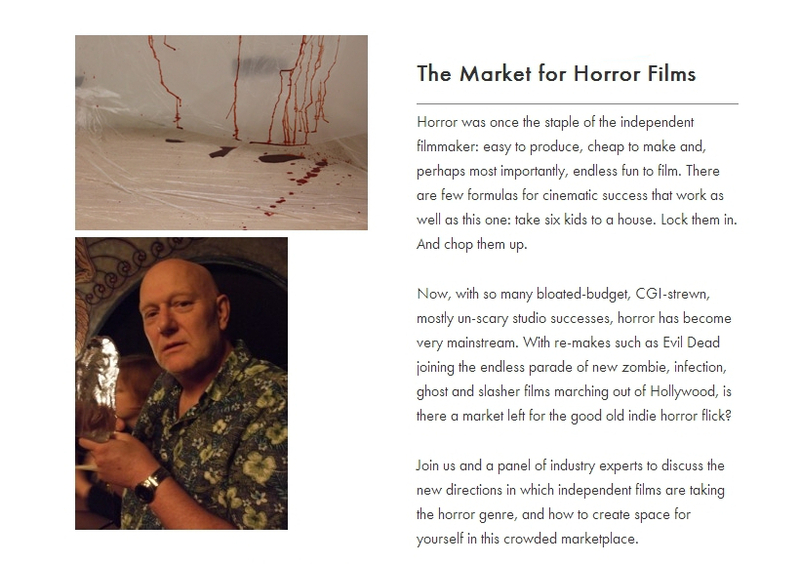 Along with Alan Jones, James Moran, and Julian Richards, I was there to talk about – well, the market for horror films, and since I’ve helpfully screencapped the page from the Raindance festival website which explains what it was about, I won’t repeat the description here. If you’re on a low budget, you might not be able to do everything you’d ideally like to do, but that doesn’t mean you can’t make a good movie. Most of the genre-defining horror movies of the last decade have been low budget. (It depends on your definition of “low budget”, but Saw was made for about $1 million, while Paranormal Activity reportedly cost just $15,000, so, y’know.) You just have to figure out what you can do with your money: what locations you can access, what favours you can call in, and what skills you have. Easier said than done, maybe, but writing a great story costs you nothing but time. All too often, the script is what lets down indie movies, and there’s no real excuse for it. Work on your dialogue, make sure your story holds up, and have a fantastic ending. It’s amazing how many other flaws can be forgiven if your script is really, really great. The advantage you’ve got over someone making a studio picture is that there isn’t anyone telling you what you can’t do. You’re probably not gonna get extensive producer’s notes on your script. So do what you want to do. Make a film you’re really really passionate about. The film that I keep thinking about, when it comes to brilliant indie horror movies, is Excision. That film is totally uncompromising and that’s why it’s great. You probably can’t afford to hire name actors (though if your script is good enough and you’re willing to work around them, you might find some big names are willing to work on the cheap) but try to at least find someone halfway convincing. Your amazing dialogue will sound terrible if your actors are useless. Again, easier said than done, but it’s not impossible. Think about your shots. Don’t film stuff for the sake of it. Way too many micro-budget movies are full of irrelevant padding shots and scenes that do nothing other than slowing down the narrative and boring your audience. Don’t do that. And for the love of God, don’t put crappy filters on your digital footage to try to make it look like film. It’ll look better without it. The other thing I’ll say, which is something we said last night, is that it’s really really important to have a stills photographer on set, at least some of the time. If you don’t have any decent images, you’re gonna struggle when it comes to promoting your film – which includes when you’re sending it to sales agents, when you’re submitting it to festivals, and when you’re trying to get websites or magazines to review it. Pictures are really, really important, and screenshots from the film absolutely will not cut it. I didn’t mean that to sound as negative as it did. I’ve seen a hell of a lot of really great indie horror films over the last few years, and I’ve also seen some not-so-great ones for sale in Tesco in shiny shiny boxes, so I believe both that it’s possible to make a great indie horror and that it’s possible to get distribution for indie horror. And nothing would make me happier than discovering the next amazing low budget horror phenomenon, so, y’know. Get on and make it, yeah?